There is this place near Southeastern University in Hammond Louisiana that has the best painting classes. They have a lot of SLU students taking the classes but it isn’t a part of the Southeastern Art Department. You will not be able to earn college credit but it does come with a fun twist. 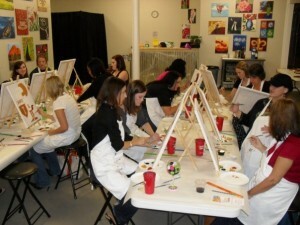 The place is called Painting with a Twist and it is as much a social event as it is a serious art class. The Twist is you can bring in your own bottle of wine to enjoy during the class. This way it makes it more relaxed and fun! Anyone and everyone can take the class. It is for all skill levels. At each class you will have an instructor walking you through the process of completing your masterpeice. At the end of the class you will be amazed by everyone’s finished product. If you are a SLU art student and you want to be a little more advanced then feel free. They have had some people in the past sell their paintings before leaving the class. What a great way for an art student to make a little income! If you are wondering how this works then all you have to do is first visit their store calendar at Painting with a Twist in Hammond and search for a painting on a day that works for you. Once you selected the painting event just add it to your cart and hit the “Checkout” button. You will then be asked to fill out a reservation form and make a payment online to secure your spot. After you have made your reservation for the class all you need to do is show up for the class on time. They will provide you will all the material and they will have a trained instructor walk you through the entire process from beginning to end. When you are done you will not only go home with the feeling of accomplishment but with some great art to share or maybe even sell! This entry was posted on Thursday, February 18th, 2010 at 4:51 pm	and is filed under Studios. You can follow any responses to this entry through the RSS 2.0 feed. You can leave a response, or trackback from your own site.